Mothers see to it that their little ones look good all the time. Some moms (like me!) would be buying so many clothes for their little ones. That ranges from sun suits to dresses, pajamas to skirts, blouses to t-shirts and so many others. Having a girl really gives me a lot of choices for her. But I guess, if I had a boy, I would still do the same. I will still get him every available clothing that will look good on him. But since I had a girl, I was given a wider range of choices when it comes to clothes. I love clothes that is why my closet is so full that some of them are already in plastic containers and bags. So, you won’t wonder if I’ll also get so many clothes for Bella. Her closet is also full. Bigger clothes are kept on a different container and smaller clothes are separated, too! All she has in her closet are those that fit her at the moment. Oh, well. Good luck to me and her closet for I am certain she will still get more clothes in the next days to come! Online shopping just makes it easy for me to get pretty clothes for Bella. But I don’t just pick any type of clothing. I make sure that I choose them well. I don’t want my baby to feel uncomfortable while on it. So, today, I will share to you some tips on how to choose clothes for your little one. Here are some things you need to consider. 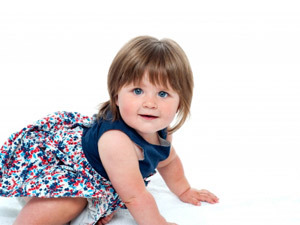 These tips are for choosing both infant and toddler clothes regardless of gender of course. 1. Know your baby’s size. First thing you need to consider is the size. Know the size of your baby. Sometimes, what you see on the clothes’ tags are not suitable to your baby’s size. It might be bigger or smaller, like if the tag says “6-12 months” but it might still fit until 18 months. This happens because clothes differ in sizes. That is why it is important to know your baby’s size. 2. Make sure it’s comfortable. A beautiful clothing is useless if it’s uncomfortable. So, see to it that your baby will feel comfortable while wearing it. It means that she can move and play freely. Be sure that it is not tight against baby’s skin. If there are zippers and snaps, check if there is a layer a fabric that protects the baby’s skin from direct contact with them for it might harm them. 3. Check how it can be worn. Make sure that it won’t be hard to get on and off the clothes you buy. There has to be a long zipper at the front or a snap at the bottom. When you are buying tops, see to it that there are openings or snaps at the upper back or front part (sometimes snaps are on the shoulder part) so that it can be opened when worn through the head. This way, you can ensure that you will not hurt your baby’s head when getting into it. If there aren't snaps, be sure that the neck opening is stretchable to fit the head. 5. Be practical. Your baby grows fast. Hence, do not be buying too expensive clothes. But if you want to buy expensive clothes for a special occasion, make sure that the price is worth it. Look into the quality of the clothing if it suits the price. You can look for items on sale or on bargains or even on shops that sell second hand clothing. Also, let it fit to your baby’s age. Infant clothes are different from toddler clothes. This is important to make sure that it will look appropriate on your baby. There are different clothes for new born babies and for babies that are already 6 months old and up. I bet you know what types of clothes are right for your baby’s age. Basically, those are the things that one needs to look into when buying and choosing clothes for babies. Moms really like to get trendy clothing for their little ones but it is always best to consider the above mentioned points in order to make sure that our babies will feel comfortable and presentable at the same time. Personally, when I get clothes for Bella, I look for those that are not tight on her skin and those that make her feel fresh and comfy. But of course, I get pretty clothes for her all the time. I know mommies out there are like me, you also get plenty of clothes for your babies. We just can’t help it! It is one of our ways to express our fondness and love for them. We also see to it that our little kids look great all the time –even if they are just at home! "Remember mommies, comfort first before fashion!" How about you mommies? What do you consider in looking for clothes for your kids? Would you like to add some tips, too? We’d appreciate your comments on this. Till next time! Great Article! I honestly get most of little girls clothes as gifts and so I can say I haven't bought any! I either get hand me downs, gifts or things from yardsales! I will def. remember all of these tips in the future! We've always been comfort and quality before fashion. I have 4 boys, and we look for function. How well are the clothes made and how long will they last? Even as far as blue jeans go, cost isn't as important and durability-we've had $15 jeans not last the week. We are always tempted to clothe our little girls with lovely dresses but sometimes we do forget about comfort. These days, I only get clothes for my daughter when it is comfortable+fashionable. Thanks a lot fro dropping by mommies! Great post/advice! My daughter was small and then hit this huge growth spurt and got super long. Always hard to figure out how to keep her looking fashionable without spending a fortune! Especially during these growing days!